October is here, and that means Halloween is right around the corner! 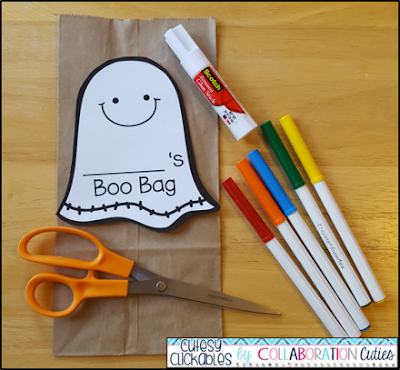 Students are always excited during this time of the year, so I'm here to share a fun behavior management strategy to help keep students focused and trying their best during the month of October: Boo Bags! This is a fun way to encourage positive behavior. Every student will have his or her own “Boo Bag.” Each day a student shows positive behavior, he or she will receive a special treat in his or her bag. Then, on Halloween students will take their “Boo Bags” home filled with special goodies! If you want to try Boo Bags in your classroom, just click here or the image above to download the Freebie. I LOVE using different positive reinforcement strategies in my classroom, and Boo Bags have always been one of my favorites! They are quick and easy to set up, and the kids love them! And it gets us all in the Fall/Halloween spirit! 1. Send home the parent letter (editable letter is included in the freebie download). 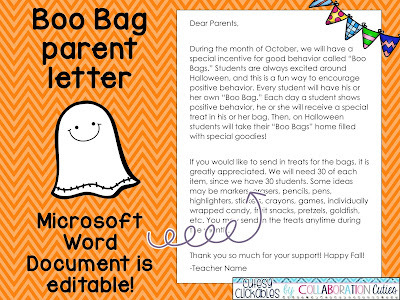 The letter explains how you will be using Boo Bags and asks for treat donations. I ask parents to send in small goodies to fill the bags such as pens, pencils, markers, stickers, individually wrapped candy, fruit snacks, etc. 2. Give each student a brown paper bag and the Boo Bag template. Students color and cut out the template and paste it on their bags. 3. Set up the bags on a table or desk in your classroom and fill with a treat each day. 4. On Halloween, have students take home their Boo Bag of goodies! I hope you and your students enjoy this Fall behavior management strategy! Thank you for the articles that are new to the reader. Thank you very much. Fall Favorites and a GIVEAWAY!